Jason White won the Heisman Trophy at Oklahoma in 2003 after throwing 40 touchdown passes and 8 interceptions. White was also the recipient of the Associated Press Player of the Year, consensus All-American, consensus Big 12 Offensive Player of the Year, the Davey O'Brien Award and the Jim Thorpe Courage Award in his 2003 season. He was also the 2003 NCAA QB of the Year as awarded by the Touchdown Club of Columbus. 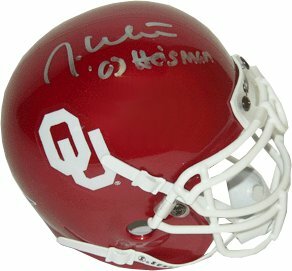 Jason White has hand autographed this Oklahoma Sooners Schutt Authentic mini helmet with 03 Heisman Inscription. Certificate of Authenticity from Athlon Sports.